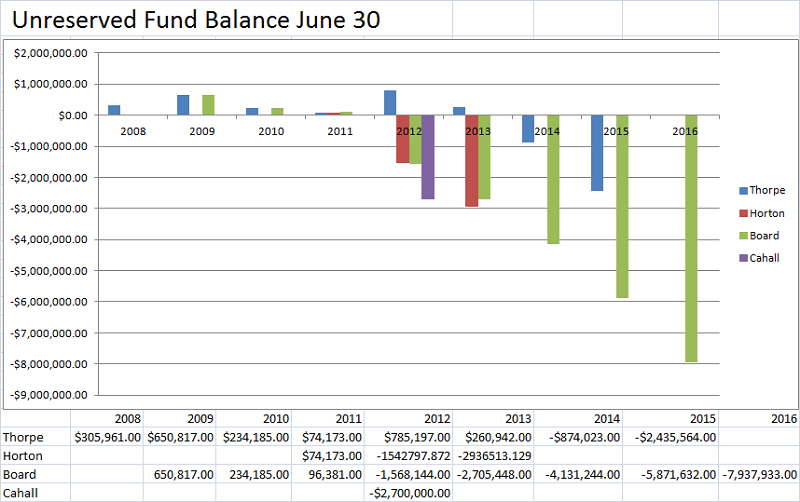 The above spreadsheet and graph displays past, present and future forcasts by former Monroe Schools Treasurer Thorpe, Ohio DOE Auditor Horton, MLS School Board and current Treasurer Cahall. Last week, Monroe Locals Schools Board, Superintendent and Treasurer help public meetings seeking input to solve the $2.7 Million financial crisis the district is facing this school year. The meetings were held on Monday and Tuesday November 21st and 22nd. According to Superintendent Lolli, "The public input meetings were very helpful to the Board of Education and the administration. Approximately 45 people were in attendance at the 5 public sessions. Additionally, each building held staff meetings for the same purpose. The input was helpful in two ways, some new ideas were given and the ideas that the Board has already discussed were validated as viable options." The next steps in solving the schools financial shortfall include submitting the $2.2 million in cuts to the ODE on November 30. Then the new Board will then put names and programs to the "cuts" skeletal framework that has been developed. Once that occurs in January, informational meetings will be held to discuss what the changes are and why the decisions were made. In February, all those that are affected will be notified. New Monroe Schools Treasurer, Holly Cahall had this to say about the meetings, ".. it was encouraging that people went to all the trouble taking time off from work – some of them, to learn about the District’s financial problems. To me, that meant they were connected and felt a genuine loyalty to Monroe LSD. I think the meetings cleared up confusion. Even though the discussion was about the financial problems we are having, it was obvious attendees truly support the District and want it to succeed, and a few were even willing to suggest a possible levy although overall that is not supported at this time."